Sarah Waite of Chalkboard Nails created this geometric design using China Glaze's My Little Pony collection. 1. 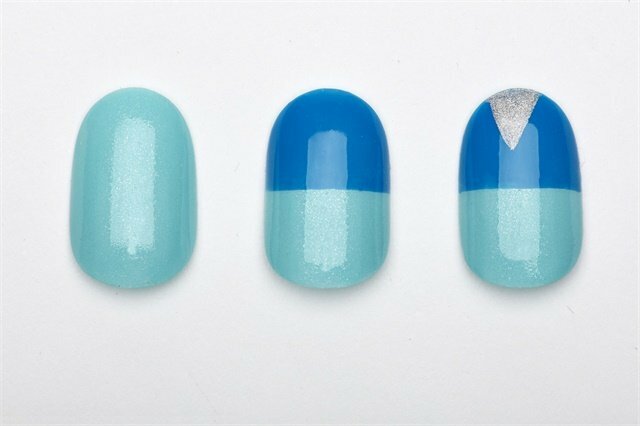 After applying one coat of Strong Adhesion Base Coat, paint two coats of One Polished Pony. 2. Using the tape technique or by freehanding, add a block of Too Busy Being Awesome to the lower half of the nail. 3. Finish the look by freehanding a triangle of I Sea Ponies.